It’s on its way up! 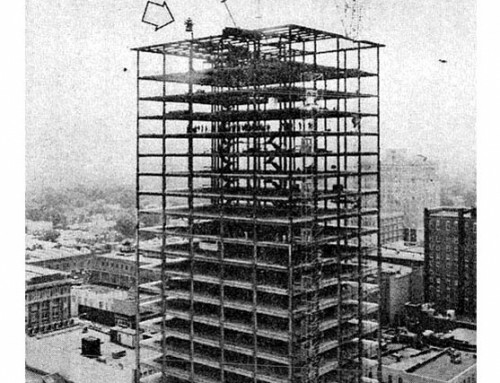 The tallest building in Little Rock – the new Union National Bank – will start taking shape upward this week. The erection crew and equipment arrived in Little Rock over the weekend, and work will start Monday Morning. 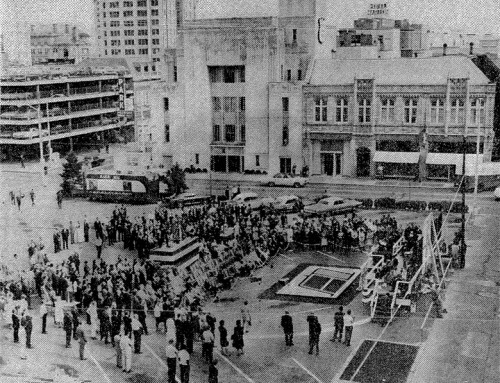 Each of the approximate 10,000 pieces of structural steel that will make up the skeletal frame has been planned, marked, tested, retested and individually cared for since the first plans were made, according to Harold Engstrom, vice president of Arkansas Foundry Company which is providing all the processed steel. After the plans were drawn by the architects, AFCO designers planned the steel needed to the inch and the cost to the penny. When they got the bid, this steel was ordered in rough form from a steel mill. 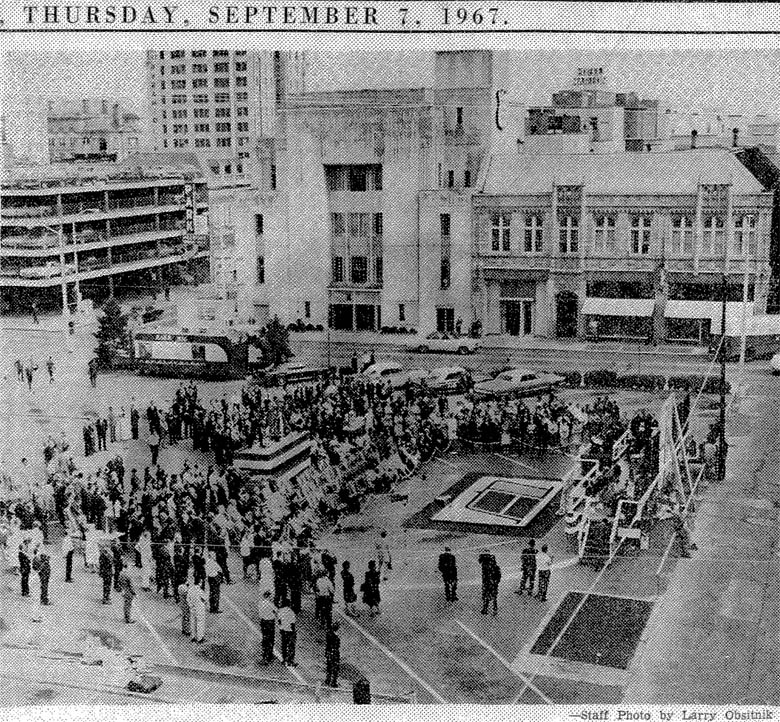 Draftsmen then drew each individual piece needed in the building showing the exact size, thickness, type of steel, and where every hole must be drilled and every connecting bar must be welded on. 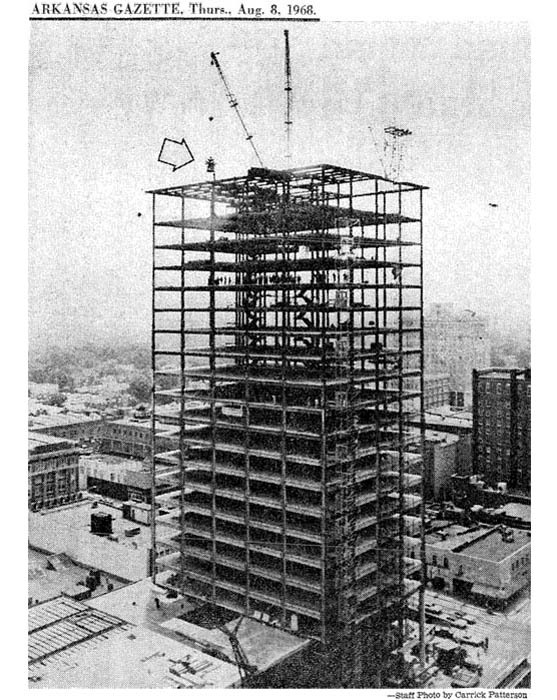 Each piece of steel was made to specifications, cleaned and marked so that the exact position on the 21-story building can be easily determined by the markers. They must make certain that each piece is transported in sequence as it is needed since there is no storage room on the building site. A chemical analysis is made of each piece of steel and every piece has its own papers, much like animal registration papers. Some 2,100 tons of structural steel will go together to make the frame of the building, heavier than any other building in the city. Three kinds of steel will used, none of which were available nine years ago when the Tower Building was built. 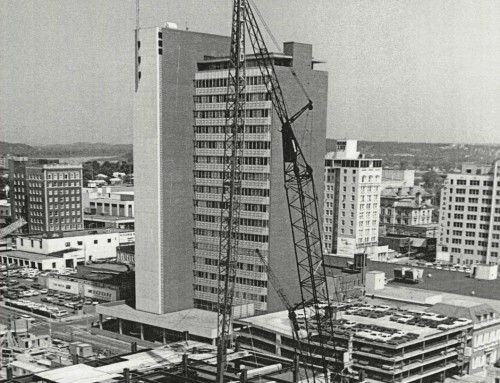 The Tower Building is presently the tallest building in Little Rock, standing 18 floors. Two kinds of high strength steel make 1,700 tons and the other 400 tons are common type. Added to this will be 800 tons of reinforcing bars of concrete and 240 tons of steel decking on the floors. The heaviest individual piece will be one column section weighing eight tons. Each piece must fit together like an erector set. According to Engstrom, each piece must meet within one-sixteenth of an inch. 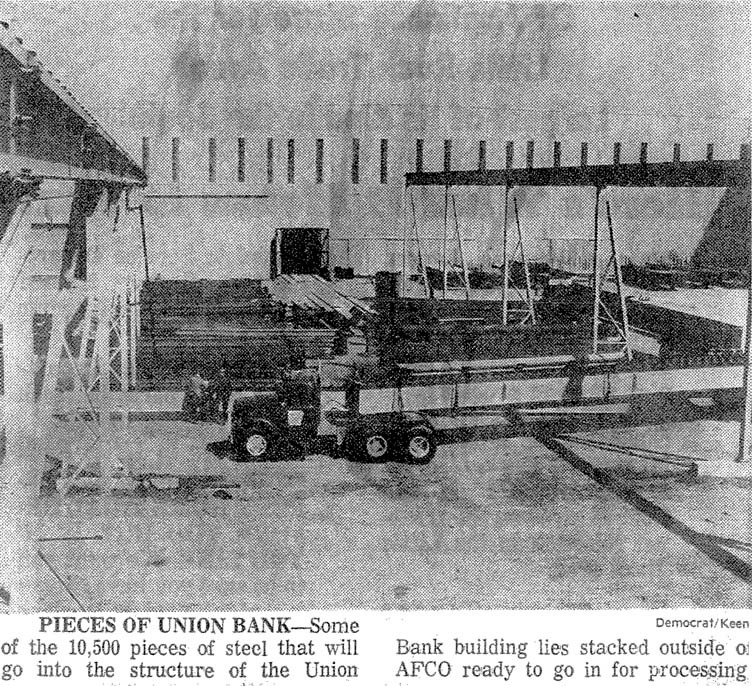 The Union Bank building has a difficult design for construction and will cause some problem for the erectors. The first four floors are set back and free standing columns go around the building and these go on up into the tower. Because of this, nine individual columns will have to go up first. They will tower alone from the basements and rise 75 feet above the ground, before anything else can be added. 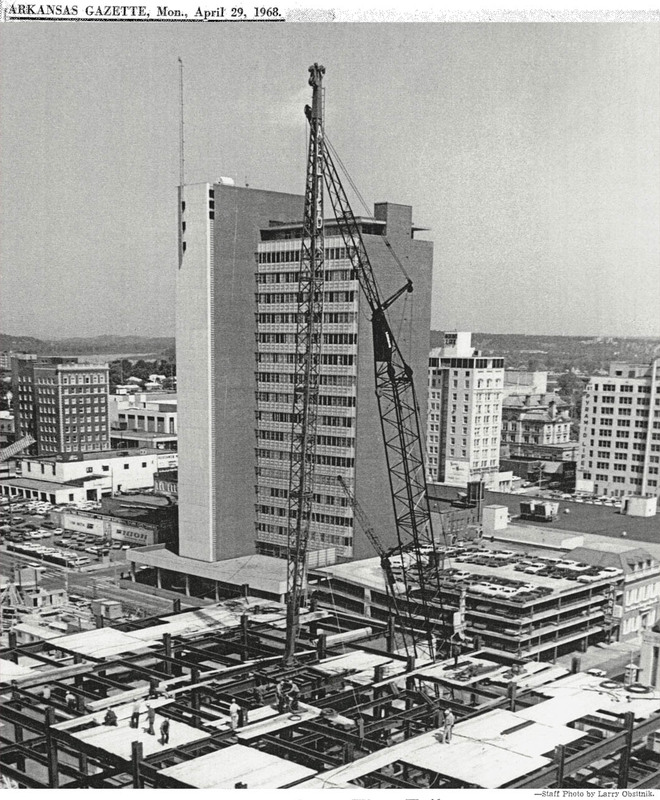 The first four floors will be erected like most of the other buildings with a motor crane on wheels with a 50-ton capacity. 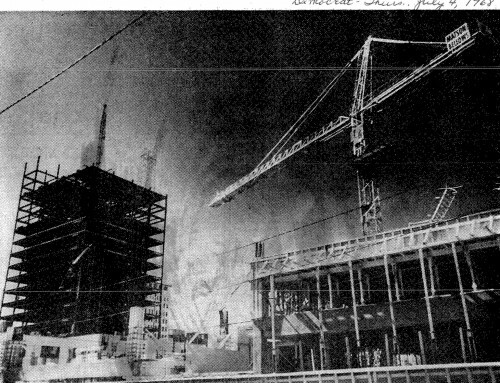 After the fourth floor is up, a derrick will be brought in that is used only in multiple story buildings. The erection has been sub-contracted by AFCO to an Oklahoma City firm. 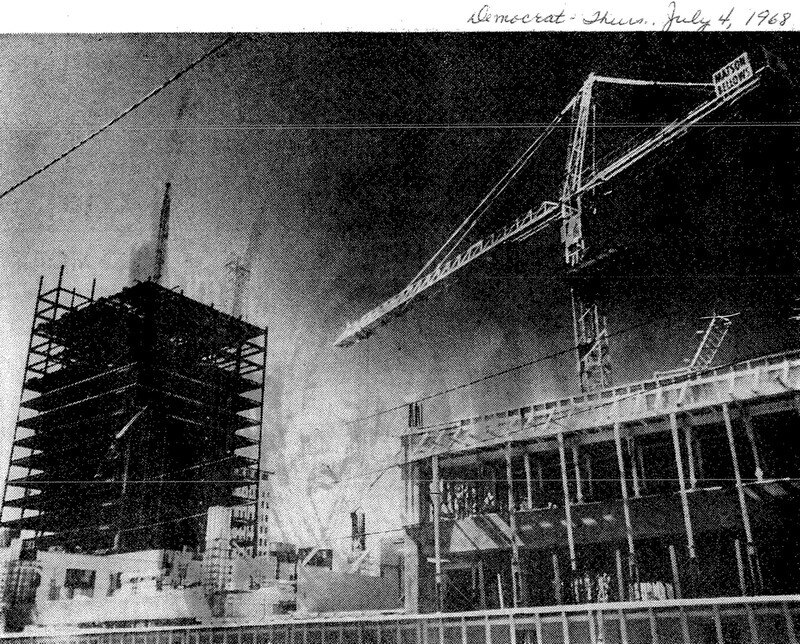 The skeleton of the building is scheduled for completion in July but the tower frame should be standing in about three months. 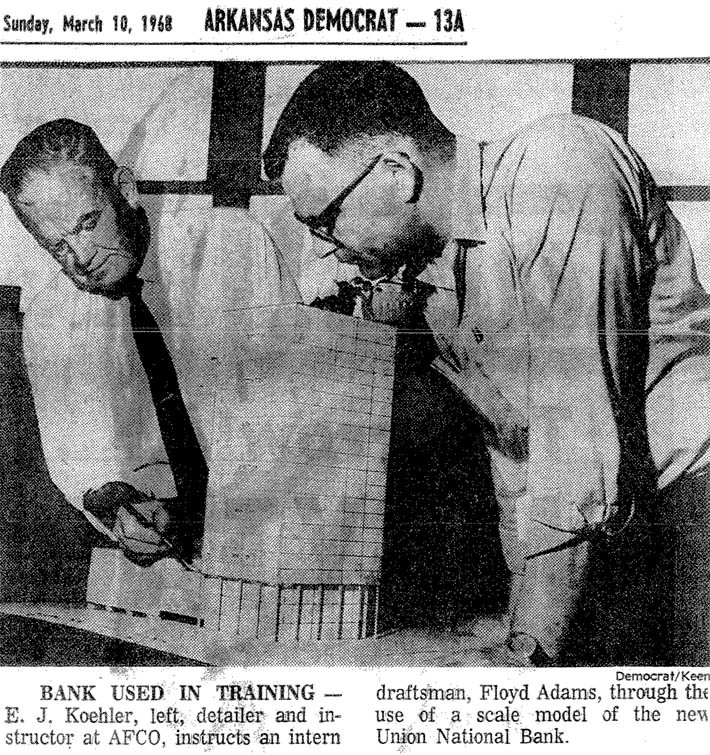 The bank is scheduled for opening in July 1969, according to Kearney Dietz of Union Bank. Concentrated leasing efforts for the 10 ½ floors to be rented will begin soon. The building will included 400 parking spaces, a 250-seat auditorium, complete banking services, club facilities, and numerous other features.